Sushi Arai (along with Amamoto) is the new darling of Edomae Sushi in Tokyo. 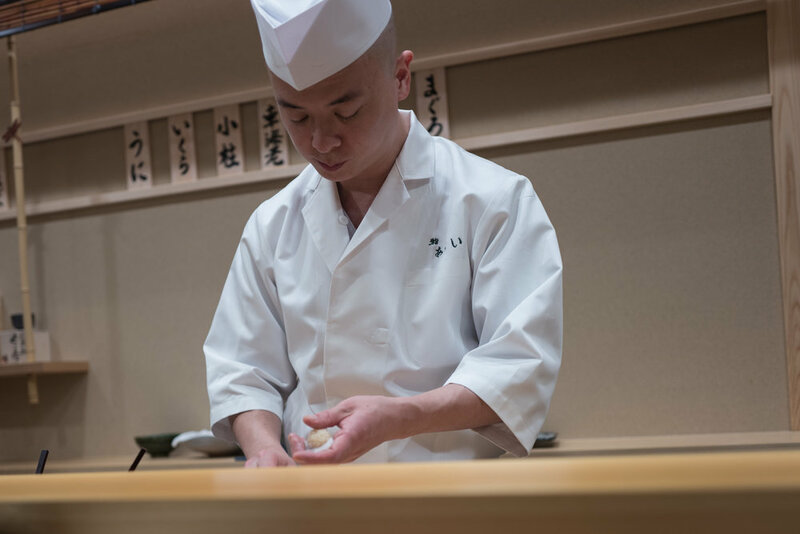 Indeed, this shop, owned and operated by Yuichi Arai-san, has only been around since October 2015, but in that short time it has earned a Michelin star and is now ranked as the #7 best sushiya in Tokyo on Tabelog, earning an impressive 4.45 ranking. Sadly, due to this newfound popularity, Arai is now incredibly hard to book, and recently it was announced that only regular customers would be allowed to reserve seats. Luckily I was able to visit the restaurant in November of 2016, just before the new booking policy was established. Yuichi Arai-san is quite young, at only 34 years of age, but he is a very experienced chef for his age, with 15 years of experience at several shops around Tokyo, including eight years of apprenticeship at the world-famous Kyubey. I went to Arai at lunch and paid roughly Y10,000 (cash only, but what a value!) for 14 pieces of nigiri. Arai-san has said that he's a big fan of Shimizu, and this is apparent in his sushi. Big, classic pieces of nigiri were served, with bold shari prepared with a blend of akazu and komezu - strongly seasoned indeed, but still very balanced. The akami and toro from Aomori were sublime, especially considering the very low price, but every sushi-dane was of the very highest quality. Arai presents a very good value for the money considering the pricy tane served. The overall philosophy of the shop does follow the Shimizu blueprint: larger pieces of nigiri with boldly seasoned shari and high quality, seasonal neta in a no-frills environment, served by a highly skilled, friendly itamae, and priced reasonably. What's not to love? No wonder it's now impossible to book a seat at this wonderful shop. During my visit, the counter was completely filled with Tokyoites, most of whom seemed to be regulars. The nice guy sitting next to me (who kindly offered me a piece of his negitoro maki) mentioned he visits once a month and bookings are hard to come by, even for locals. I purposefully chose to take few photos during this meal, preferring instead to interact with the chef and customers at the counter. Below are the few shots that I did take during this wonderful meal.